As you move through your day remain open to those things which give you a sense of joy and fulfillment. Write them down as you experience them, realizing that they may very well be worthy of more of your time. When you spend time in pursuit of the things you are passionate about life moves more easily than when you are working on things which don’t give you this same sense of fulfillment. While it’s vital to seek out and dedicate time to your passions be sure to give your absolute best in whatever task you find yourself in. When you become a person who is known to give your best in any & every undertaking it never goes unnoticed. Opportunity seeks to find that special breed of person who treats even the most seemingly menial things with the same enthusiasm they would more monumental undertakings. Whether we realize it or not those with opportunities to share always exist and they’re always actively looking for people who give their best in all they do. Strive to be that person and you will be the beneficiary of many incredible rewards. Keep clearly in mind that how you treat the little things often determines how many chances you will get to do the bigger things which in turn leads to greater rewards in life. PS. 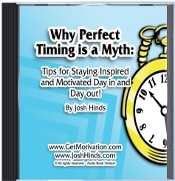 Get details on having me inspire your group by visiting JoshHinds.com.